Also known as, my five-year old daughter’s advanced tongue’s favorite food. And she replies, “No, mother dear. ‘Tis the shrimp I desire. By the way, you look radiant today.” Exactly like that. She says it just like that. So I make scampi quite a bit! Sometimes for a snack. Sometimes for dinner. 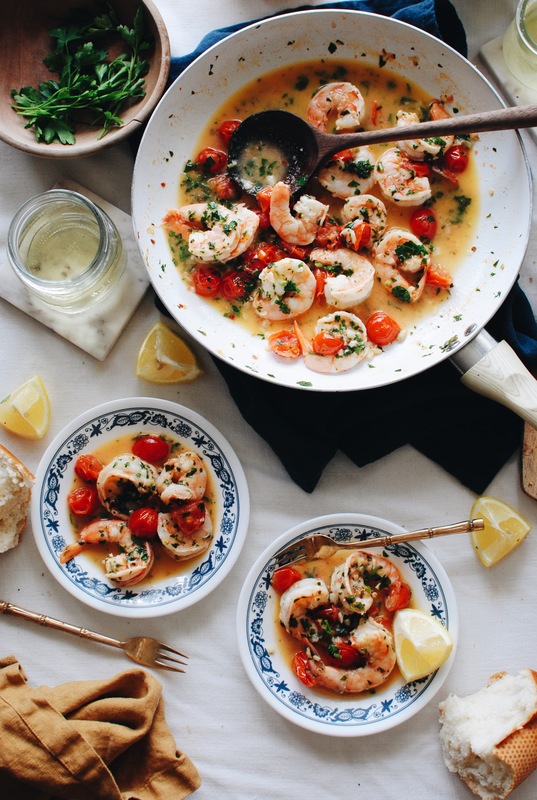 And I decided to make it for your faces, in case you need another whip-it-together meal that tastes like a bunk ton of work, but is surprisingly effortless, delightfully elegant and absolutely scrumptious. I look at this photo and I’m like, that is all I want in my life. Wine, bread, butter, spice, acid, tomatoes, garlic, bright green her- WAIT, NOT LIKE ACID ACID, ya weirdo. Lemon juice. Acidity. Zing. You know I have to have that zing. That zippidy zing. And then obviously more of that white wine. You’ll thaw the shrimp. And listen, when you’re buying the bag, get the BIGGEST shrimps. I think this bag had around 20 in it. Don’t get the little popcorn shrimp kind, unless that’s totally your jam and gives you giddy pants. Then by all means, buy that kind. But if you can, go for the biggies! I feel like they’re more European, but I’m living in my head. 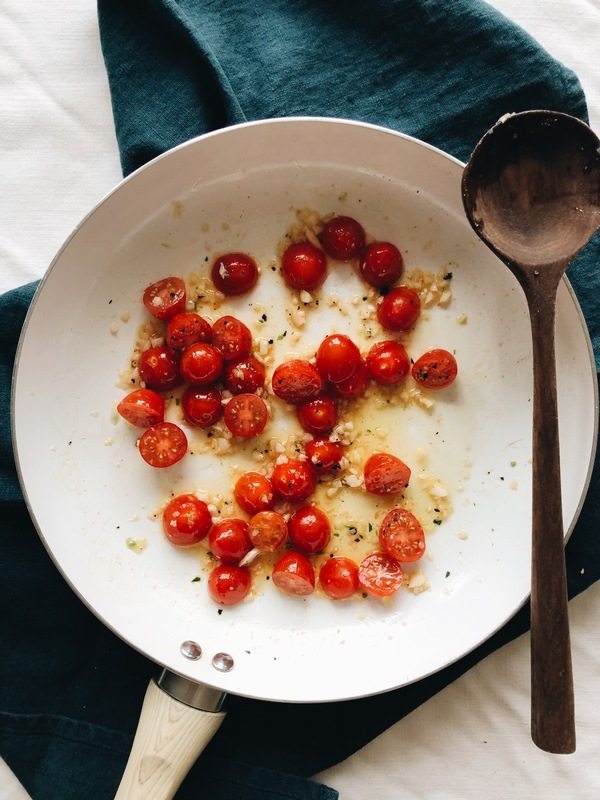 Melt that butter and sauté the garlic and (halved) cherry tomatoes. Just for a second. Thirty seconds. Until that garlic fragrance punches you in the nostrils and makes you their b. Then stir in the wine and red pepper flakes, and let it simmer for two to three minutes, juuuust until the tomatoes barely begin to wilt and slightly burst in places. You should be well on your way to tears by now. Add the shrimp, and season it all with a good pinch of coarse salt. And add the lemon juice! Let the shrimp simmer in the lemony tomato garlic wine just a couple of minutes until it’s opaque all the way through. You won’t get sear marks, since they’re braising, but that’s what we’re going for here. A gentle cook on the shrimp. Then the chopped parsley goes in and boom. FINI. I hope your mouth is prepared for this because MAMA DID SAY KNOCK YOU OUT earlier. 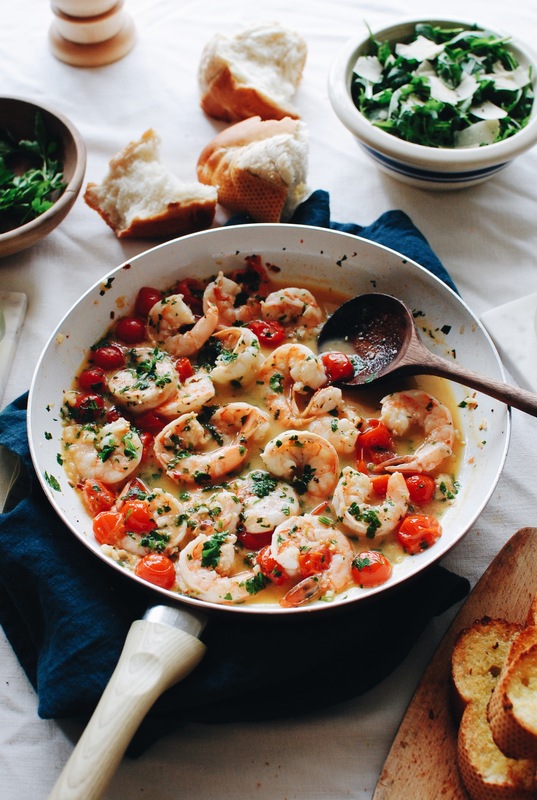 And this is the thing – serve it family style with a bunch of crusty bread and a simple green salad. So amazing. You’ll SEE that I have two sorts of crusty bread in these photos. Some torn, some toasted. This is my life. Torn and toasted. Just love me. Obviously you’ll season to taste, so give it another pinch-pinch of salt if it needs. I am TELLING you, you’re going to lose your dang mind. Especially when you dunk that bread into the juices OMG. Sop up the sauce, man. Do not live another day without sopping up dat sauce. 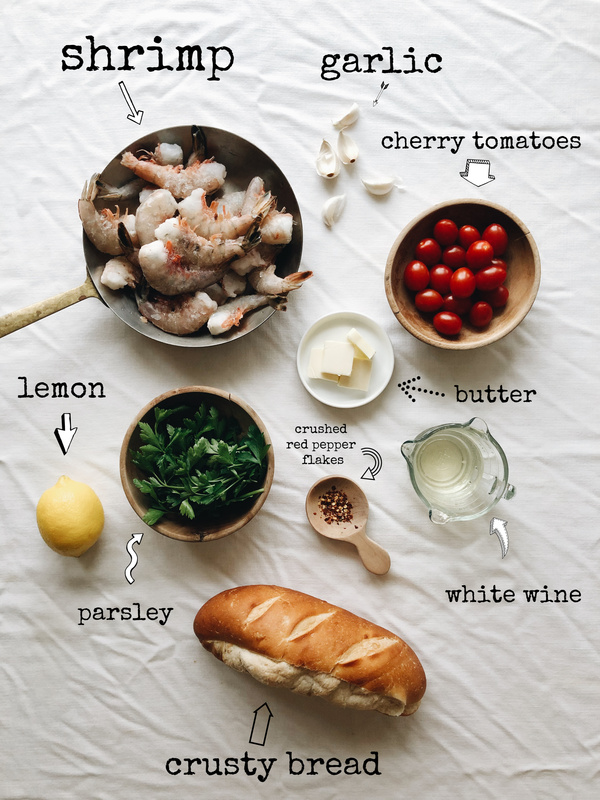 Make this tonight! It’s pretty much simplicity wrapped in a luscious WOW blanket. Melt 2 Tbs. butter and 1 Tbs. oil in a large sauté pan. Add the garlic and tomatoes, and sauté for 30 seconds, until fragrant. 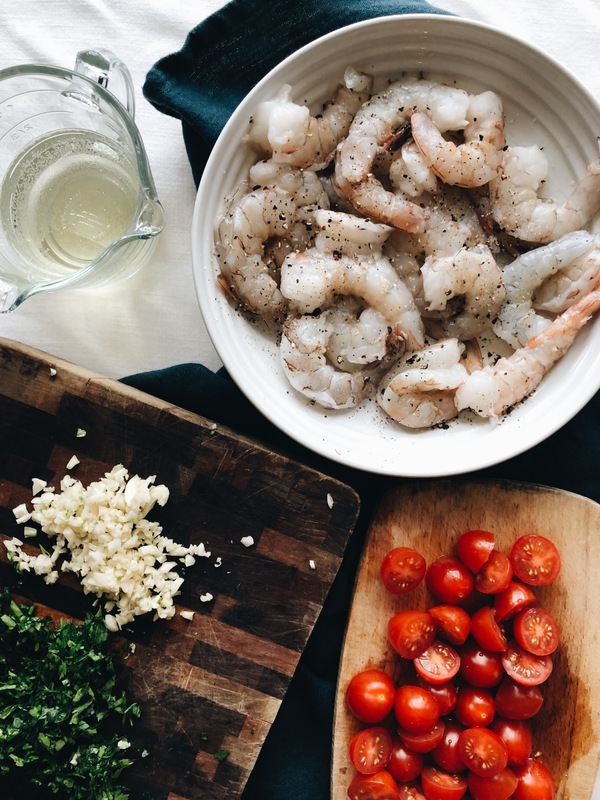 Add the remaining butter, wine and crushed red pepper to the pan, and let the tomatoes and garlic simmer for 2-3 minutes, until the tomatoes begin to wilt. 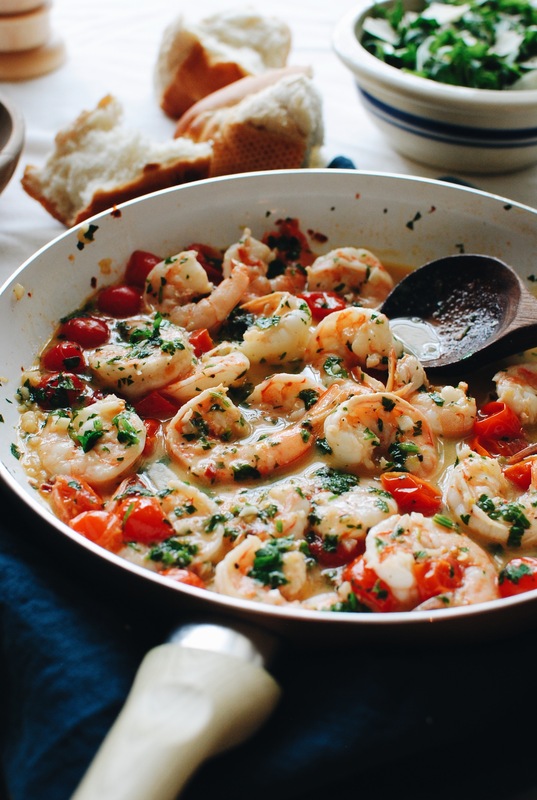 Add the shrimp to the pan and season with a good pinch of salt. 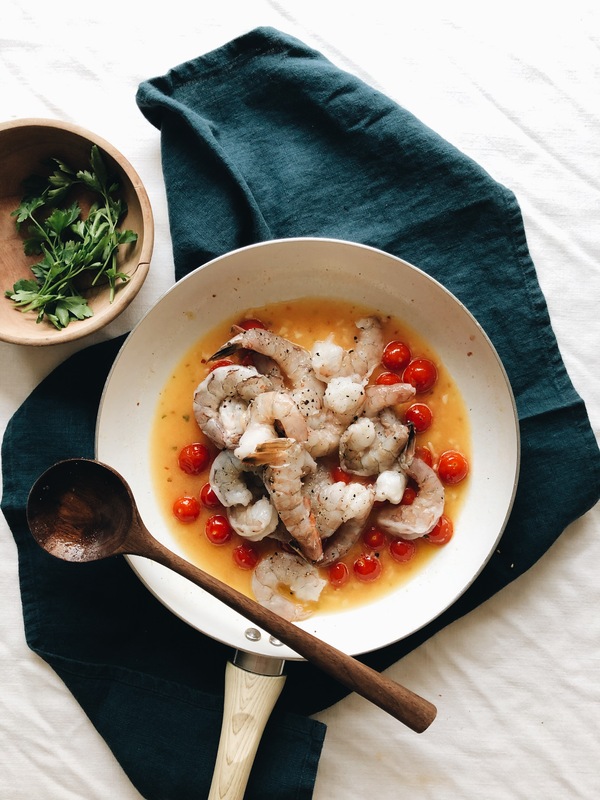 Squeeze half the lemon into the pan and let the shrimp cook about two minutes, until opaque. Stir in the parsley and give it a taste. Need more lemon? More salt? Season it to your liking. 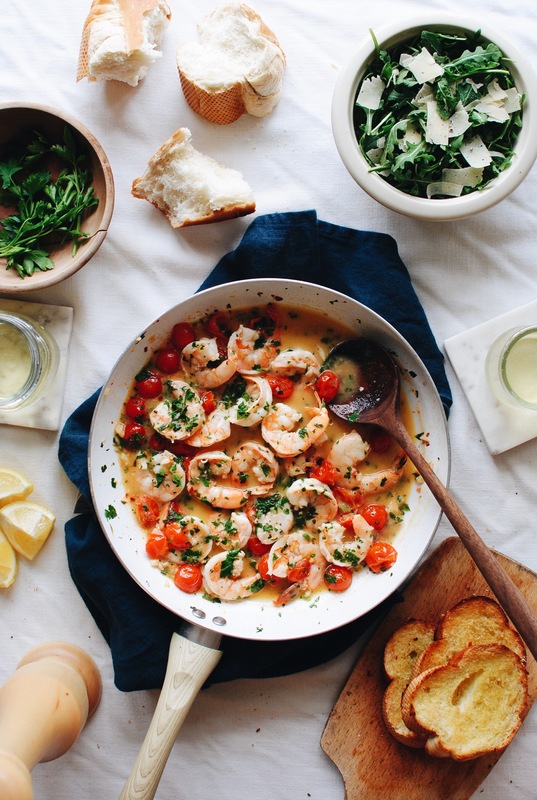 Serve this deliciousness with toasted crusty bread and a simple green salad, and dive in! But save some for Nat. So YUM! When I was 5 my favorite foods were shrimp and artichokes. But I only referred to them as "pink things and scrapers". It took my mom weeks to figure out what meal I was asking for for my birthday dinner. To this day we call them "pink things" in our house! Thank you for this delicious recipe- can't wait to try! My 7 year old loves shrimp too! He will ask for one of those shrimp cocktail tray things at the grocery store and then eat the whole thing himself! My kiddos love shrimp too! Such little fancypants! 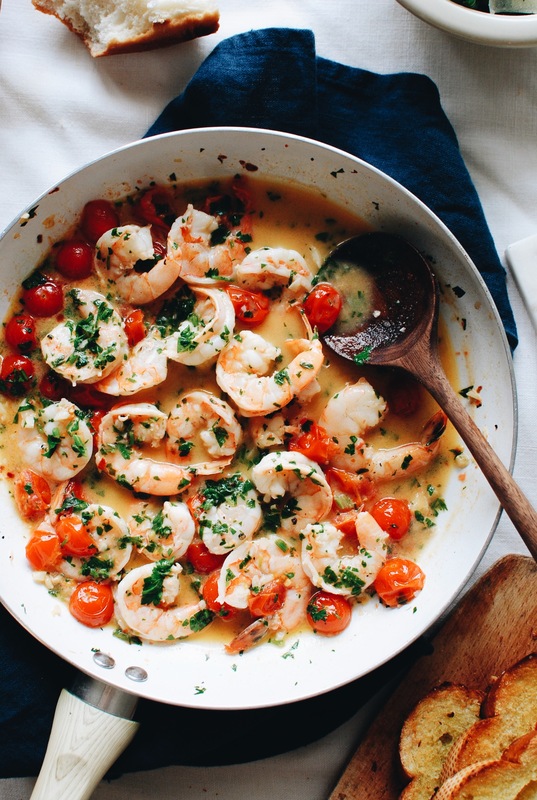 This looks deeeeelish and would be fab with mussels too I'm sure. My pre-schooler isn't into shrimp...yet. I'm workin' on it. He'll go for it inside a taco or if it is accompanied by rice in the same bite. Maybe with that great toast? We'll see!